Writing is a competitive business. As hard as it is to get published, it is even harder to stay published—in other words, to have a successful writing career. I’ve seen great writers publish one or two books and then vanish from the shelves, while more mediocre writers publish novel after novel. A lot hinges on your first sale. Before that first sale, you’re an unknown quantity. If an editor takes a shine to your work, she’ll give you a shot and boom, you’re a published author. Your only competition is the other manuscripts on her desk. After you publish, it’s a different story. Once your book hits the stores, you’re not just competing against all the other books on the shelf—you’re also competing against yourself. If that first novel doesn’t sell well, it’ll be the only book you publish. Why? Because after your editor buys your first book, she’s pretty much powerless to buy anything else from you unless the sales of that first book support her decision. So how do you improve your first book’s chances? Shameless self-promotion. Many writers (myself included) find it hard to toot their own horn. Writing is a solitary, private practice usually chosen by solitary, private people. Sure, we write in coffee shops and parks, and we have friends and go to parties and tweet and all that. But when you boil most writers down to their essence, you find we are mostly introverts. On top of that, we’re not sure our work is any good, and we’re really scared to find out. So scared, we don’t send it out to agents and publishers, and sometimes we don’t even write at all. When we finally do conquer those fears and we actually get published, we’re scared to promote it—afraid of looking cocky, or jinxing ourselves, or any of the other silly excuses we use to keep ourselves from being successful. Bad news, kids: you have to do the work to get the rewards. 1. Tell a great story. This is easier than it sounds. Read Joseph Campbell’s The Hero with a Thousand Faces to get the bare bones of how storytellers throughout the ages have told great stories—from Homer to George Lucas. See also, Emma Coats’s tips from Pixar. And if you want to really dive deep, pick up a copy of Story: Substance, Structure, Style and The Principles of Screenwriting by Robert McKee. Then tell a great story of your own. Great stories get published. 2. Get active on social media. Neil Gaiman is the very model of a modern major novelist. He tells good stories, and he is no slouch when it comes to shameless self-promotion. Neil flogs the hell out of social media, posting blogs, updating Facebook, and tweeting like mad to his nearly 1.8 million followers on Twitter. He’s got a Tumblr account, and probably a presence on other social media sites like Pinterest, Google+, and who knows what else. So what should you do? Find some social media platform that you like and use it to open a conversation with your fans. You don’t have to share every detail of your life, but don’t be afraid to show your personality. Talk about your passions, and ask your readers about theirs. Share links and other things that interest you. Don’t expect a huge following at first; just establish a presence now, before you get published. Build a rapport with your followers. Reply to them. If your publisher wants to set up a book tour, do it. Even if it’s local, or far away, or if it scares you to death, or it seems like a waste of time. Take a page from Nike and Just Do It. And if your publisher doesn’t want to set up a book tour, set one up yourself. Reach out to all the bookstores within a day trip and set up a signing, or offer to give a reading. Write a press release and send it to your local paper, and the major papers in your state. Let them know you’re available for interviews. Send releases to your local news stations. Spread the word far and wide. And, of course, share it with your social media followers. Ask them to help you spread the word. You’ll be surprised at how many people will want to help! Do some guerrilla marketing, as well. Pick up a copy of Guerrilla Marketing for Writers: 100 No-Cost, Low-Cost Weapons for Selling Your Work , and discover some great ways to spread the word about your book. Another great book (although not specific to writers) is David Meerman Scott’s World Wide Rave: Creating Triggers that Get Millions of People to Spread Your Ideas and Share Your Stories . Have a contest for free copies of your book, or something related to your book. It doesn’t have to be an expensive prize for people to enjoy winning it. And don’t be put off by the word “free.” Yes, you want to boost your book’s sales, and giving it away may seem counterproductive. However, many writers and musicians have found that by giving their work away, they actually make more money. It helps spread word of mouth, and it helps build your audience. Take a look at what some other new writers are doing, and steal their ideas. Get in touch with them and ask what worked and what didn’t. Again, you’ll be surprised at how many will want to help! 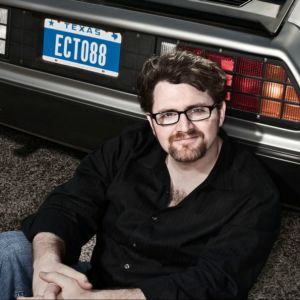 One of the best book promotions I’ve ever seen is for Ernie Cline’s first novel, Ready Player One . I’ve been a fan of Ernie’s ever since his early spoken word days, so I bought the book the first day it came out. Ernie didn’t disappoint, either; the book is one fantastic ride from page one to the end. Ernie wrote a great story. Ernie knew that wouldn’t be enough, though, so he got active on Twitter and Facebook. He blogged and tweeted and shared where he’d be signing and things people said about the book, and his genuine enthusiasm about being a newly published author. It was infectious, and people loved it. He filmed goofy videos featuring himself and Ecto-88, his tricked out dream car—a 1982 DeLorean. The car features prominently in the book, so he used his advance and bought the car as a “business expense” (really, he’d just wanted one since he was a kid) and drove it across the country to book signings. He’d let people sit in it, get their pictures taken with it—in general, he’d use it to get people aware of and interested about his book. It was guerrilla marketing at its best. See, Ernie’s book is about a puzzle. In it, the hero (a young boy) and millions of others struggle to solve the riddle that a dead video game creator left behind. Solve the puzzle, and like Willy Wonka, you get the video game company and become a billionaire overnight. Since the creator was a child of the 80s, the puzzle (and the book) is rife with references to the sci-fi movies and games of that era. So Ernie published his book and bought his DeLorean and did his guerrilla marketing. And because of all this (and because it is just a fantastic story), the hardcover sales went like gangbusters. Weeks on the bestseller lists, foreign rights sold all over the world, movie rights snapped up by Hollywood, and so on. But Ernie wasn’t done yet. Is your jaw on the floor? Mine was, and here’s why: not only is this a brilliant and incredibly generous promotion, but it shows that Ernie had planned this all along! The easter egg was in the first edition, in hardcover, and he didn’t mention it once during the initial promotion blitz. Didn’t so much as hint at it, as far as I know. Yet, at some point while he was writing the book, he snuck that URL in there. And waited. And waited. And now he’s got everyone talking about his book again, even though it’s been out for almost a year. That, my friends, is how you shamelessly promote a book. What’s your favorite book promotion? Leave a comment and let me know! Ah! Yet another reason I’m a tech writer and not a real author. « How would you describe the color green to a blind person? You are currently reading 3 Steps toward Shameless Self-Promotion at Kicking the Pants.